Owen Ransen Registered Autodesk Developer and has created many custom AutoCAD, Inventor and DXF based programs and plugins for customers all over the world. Projects include automatic design of components from specifications entered by sales people, component design according to engineeing specification, and calculation of production costs and times. 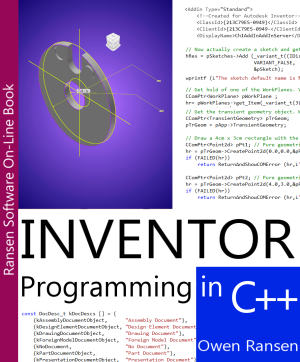 Owen Ransen's "Inventor Programming in C/C++" is a free on line help file of code fragments for C++ programmers who want to write Autodesk Inventor plugins. Packed with tips, examples and code fragments it is an ideal companion to any Inventor C++ programmer. 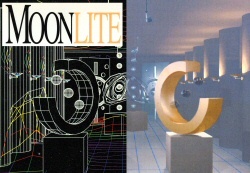 Owen Ransen wrote MoonLite (an AutoCAD plugin) for Martini Illuminazione of Modena, Italy. It was one of the first photometric rendering programs which combined ray tracing with radiosity to give a photorealistic and photometrically correct result. It had two parts, a standalone EXE for Rendering and the photometric illumination calculator plugin for AutoCAD. "Ransen's ObjectARX Course" was a CD based interactive set of tutorials on programming AutoCAD in C++ using ARX, the successor to the AutoCAD Development System (ADS). Owen Ransen wrote "AutoCAD Programming in C/C++" to teach how the new AutoCAD programming system which replaced AutoLISP could be used to create AutoCAD plugins.